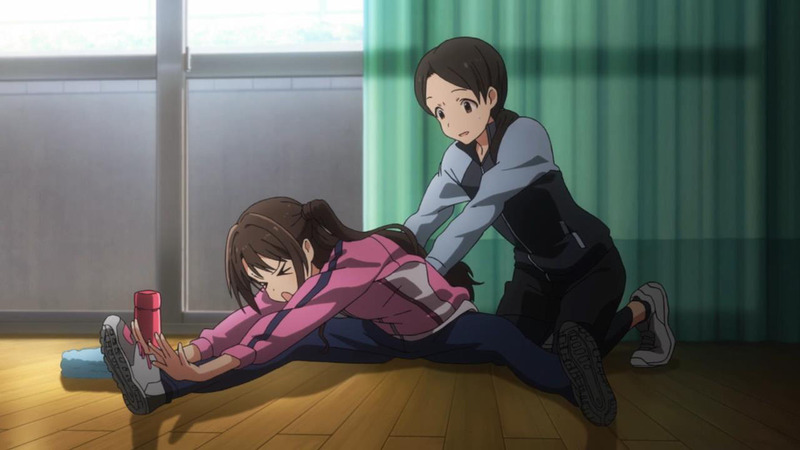 I tend to describe THE IDOLM@STER as a slice-of-life, but it is, at its heart, a sports anime. We have young people training ceaselessly for that next competition, shedding sweat and tears for their dreams, occasionally running off into the sunset, all that good jazz. Sure, it’s about showbiz, but it’s about showbiz infused with sportsmanship, unshakeable camaraderie and never-say-die attitudes that you wouldn’t associate with this rather cynical industry. The hypothetical FOOTBALLM@STER would be a very similar show. 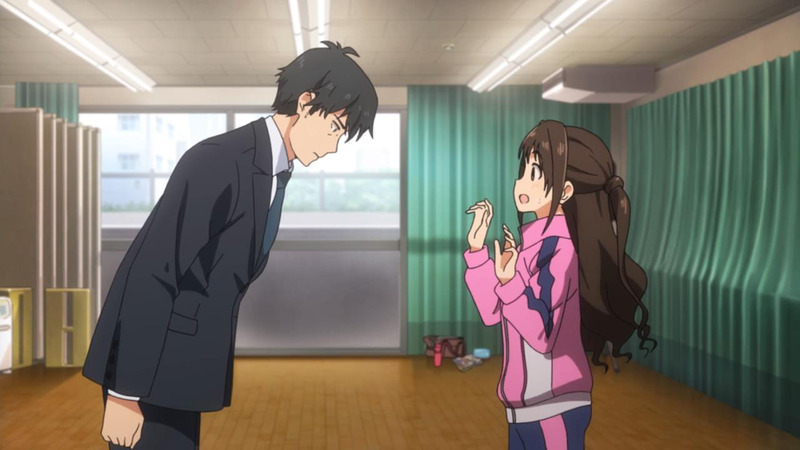 As sports anime go, THE IDOLM@STER is an incredibly idealistic show. 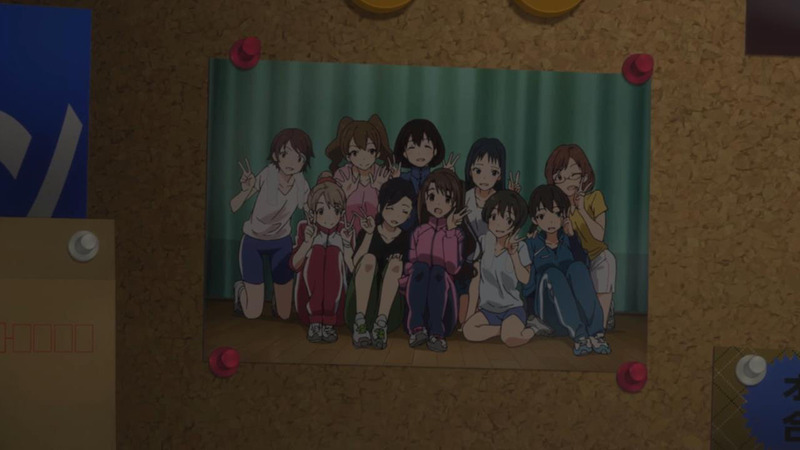 Whereas sports drama in Japan is usually about the struggle for the sake of the struggle (and the protagonist team would often ultimately lose), THE IDOLM@STER is almost a Disney variation. 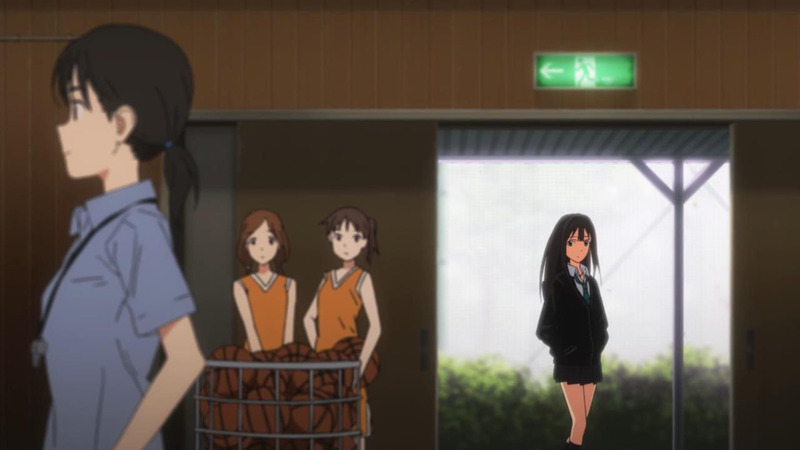 Consider Cinderella Girls‘ central metaphor. It’s about young girls dreaming of becoming princesses. That’s Disney magic right there, complete with musical numbers. This is a fairy tale (of the non-Grimm variety), a wholly romanticised version of reality. In fact, Cinderalla Girls intentionally and completely denies base pragmatism. Our main lead, Shimamura Uzuki (Ohashi Ayaka) is not actually sure what an idol does, but is still enraptured by the dream. That’s the kind of show this is. So, all in all, Cinderella Girls isn’t all that different from its predecessor. It is, however, presented slower. The story starts from the very beginning, before our girls have even been employed by their agency yet. And the focus is kept firmly on our obligatory irrepressible genki girl and her stoic foil, Shibuya Rin (Fukuhara Ayaka). 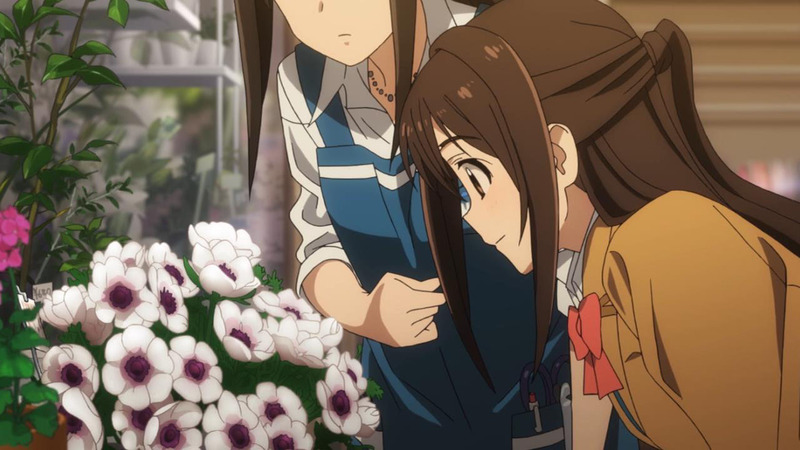 Those who have watched the previous season will identify them as the Haruka-Chihaya analogue who will serve as the focal point of the narrative, so it’s appropriate that they are given more time in the first episode. Other Cinderalla Girls are still used constructively, to create a sense of an expansive industry into which 346 Production must eventually penetrate. I think this narrow approach is good; it gives a clear sense of ‘main characters’ and doesn’t overload the viewer with too many faces, names, and background information in the first episode. I, personally, actually know very little about the greater IDOLM@STER franchise, and appreciate being eased into the anime, unlike the bustle of Kantai Collection earlier in the week. The other thing I think Cinderella Girls does differently from KanColle is making the player avatar character from the source game into a bona fide character. 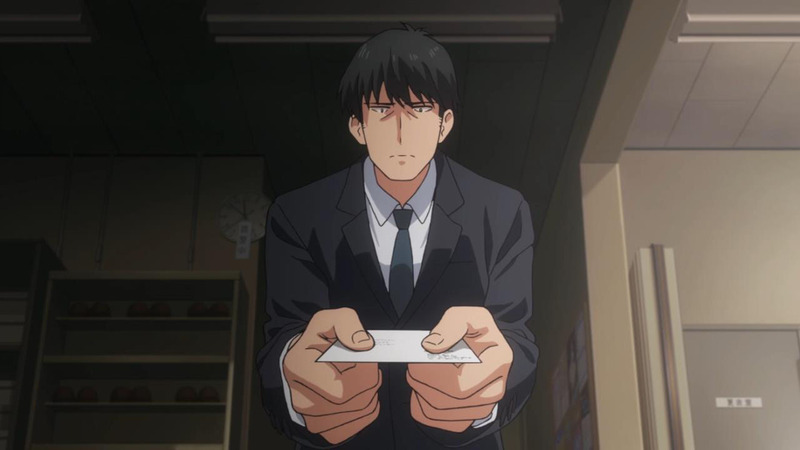 The ‘Producer‘ (Takeuchi Sunsuke) of Cinderella Girls is, more-or-less, the inverse of the one in the previous series, a stone-faced man of few words who nonetheless still starts as being rather awkward at his job and frequently displaying a nervous tic. There’s actually a bit of a creepy subtext of a corporate face trying to solicit young girls, but even that is so steeped in idealistic goodwill that you can’t feel too bad about it. The producer is only seeking passion. Wow. Negativity is simply not allowed in this show. 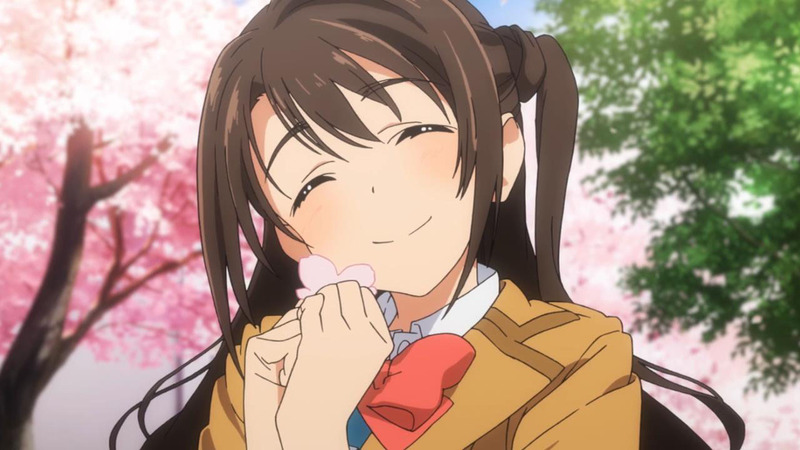 If you need a soul-healing kind of anime this season, one that restores your faith in the human race and just makes you feel better about the world, then I recommend giving THE IDOLM@STER: Cinderella Girls a try. I’m unlikely to be covering it regularly on Random Curiosity, but I do have faith in its power as a weekly pick-me-up. 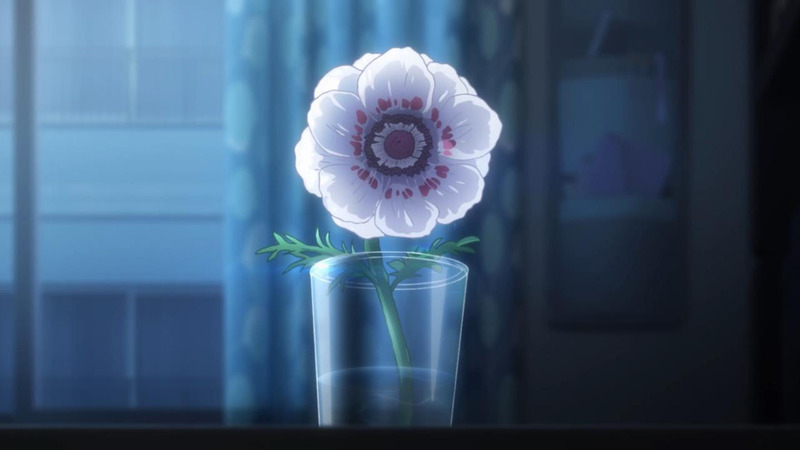 It’s a pleasant looking show (CGI flower petals aside) very comfortable in its pacing and direction, never in a hurry to be something overly complex. Sometimes, a simple show where you know, despite ups and downs, there will always be a happy ending, is just what one needs. It’s like reconnecting with your inner child, and I think that’s a healthy exercise. It’s my girls! SQUEEEEEEEE! …I should probably finish watching that season some time. Azusa cameo please, please, please! You should! 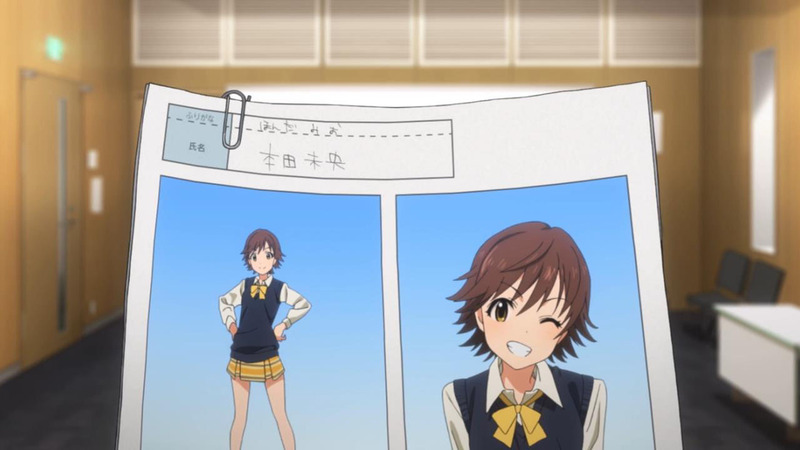 Unlike this pilot, the pilot for The IDOLM@STER already has the 13 girls together as best friends, and the pacing is fast, we get to know all of them, and they are immediately appealing and likeable in the first episode alone. There is also an OVA for one of the games. Live for You I think? I don’t really know, but the seasons aren’t actually contiguous, as far as I can tell, beyond little shout-outs like that image I linked above. 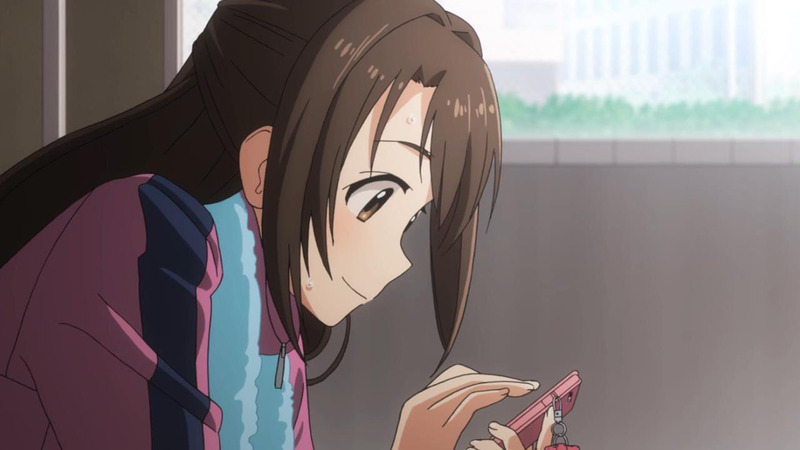 Cinderella Girls is it’s own self-contained story: it isn’t continuing where The IdolM@aster left off. While the stories may be set in the same universe, everything I’ve heard suggests there won’t be any significant overlap between them, so you can watch this series on its own merits if you want to. Don’t forget the various mangas as there as quite a significant number of them. The quality varies though. Some which are great to read like The Idolm@ster: The World Is All One!! and some are downright awful like The Idolm@ster: Break. 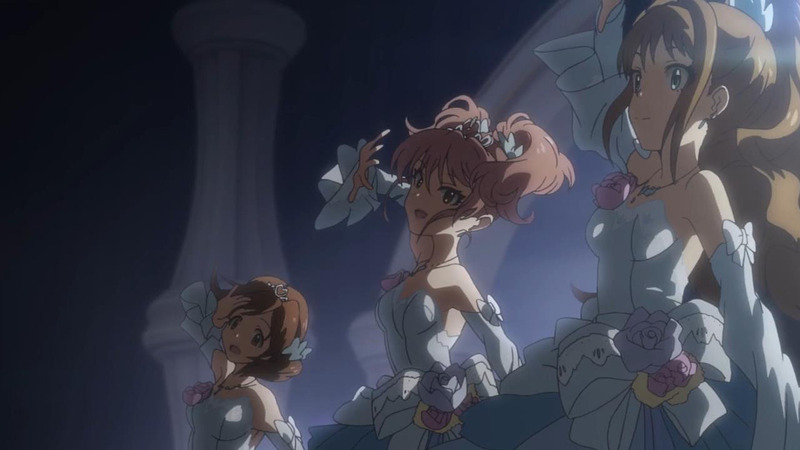 The Idolmaster series as a whole is less like a monolith and more like a hive fleet; there are many different works and adaptations, which may or may not plausibly share continuity. So while you have out there the original video games, a myriad of official manga, a mecha anime spinoff by Sunrise, and that 4koma that has all of those weird Yukkuri-like doppelgangers, the only one you really need to care about right now is the 2011 25 episode + OVA Idolmaster anime series. It’s also by A-1, and Cinderella Girls may reference it. The A-1 continuity family also includes the three Shiny Festa OVAs and the Beyond the Brilliant Future movie, but these are pretty self-contained and will most likely not be needed to watch Cinderella Girls. Sigh. Another cute girls doing cute things show. Skipping this one. I feel you, honestly I do. I wish these types of series would all die in a fire, but given the sheer amount of them and lack of any other types of shows lately, I figure I might as well give the cute ones a try rather than those horrific trashy harem ones. Why hate? Hate is not constructive. Especially so if you’re hating purely on first impressions; you’ll miss out on a lot of neat things in life. I think HATE deserves to be given to series that have too much pre-air hype but it falls flat during the season. No! No hate! The IDOLM@STER post is also a hate-free zone. Let us only think positive thoughts here. Sgt. Oddball…. Is that you? Sigh. Another person who hates [insert show/genre here] and feels the need to announce it to the world. I swear I’ve seen you post something negative on a number of shows already, you really got nothing better to do than look at stuff you don’t like? It’d be different if you actually had some valid criticism to make, but judging from your post you didn’t even bother watching the episode before making a blanket statement. These type of generic highschool girl animu are made by otakus with no girlfriends. I understand what you’re implying, but Toriko Noriko is a woman, actually. Perhaps you aren’t familiar with them. Does the idealistic tone bother you, Passerby? I thought I detected a hint of skepticism. This is my first venture into an idol anime. My expectations were rock bottom, but this first episode was a pleasant surprise. I actually thought the characters were already adults until they mentioned Rin’s age, and the Producer is cool in his own way. I think this could definitely be something I’d enjoy. I’m a sceptical person by nature, so I’m incapable of channeling THE IDOLM@STER‘s positive energies with an entirely straight face. But I actually do enjoy shows where everything is just so… nice. I was a fairly ardent fan of the original series. I would recommend trying that one as well. The odd thing is that the sports movie/negativity not allowed comparison is one I always thought applied far more to Love Live, which is why I never particularly bought into that show. 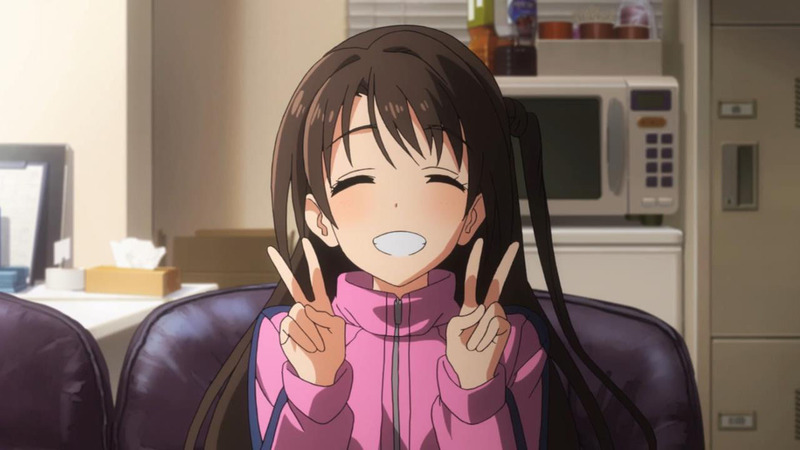 Presenting a reasonably realistic narrative while staying true to a generally positive tone was something I thought the Idolmaster anime did surprisingly well, which is why I actually liked that run despite being less than lukewarm about the Idolmaster franchise itself. Idolm@ster was one of the few series which initially wasn’t in my radar, slowly getting recommendations, until I finally decided to watch it. The gradual buildup and last two arcs are a blast! I finally watched the first episode. 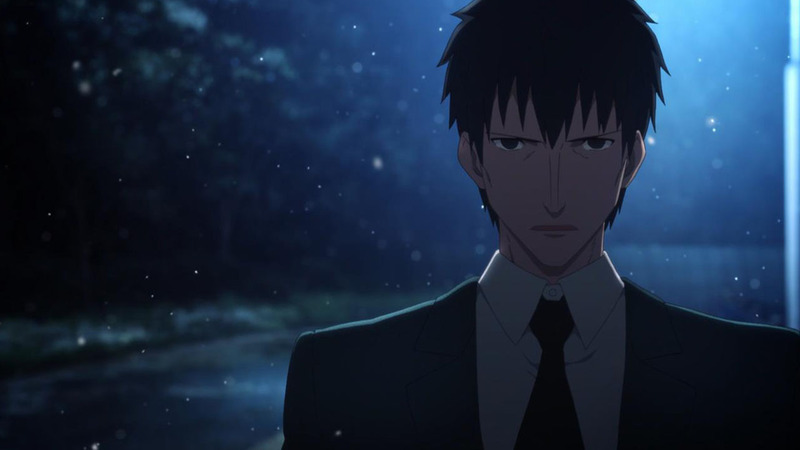 Surprised to see the best master in FSN here, seems like he switched job to be an idol producer after the holy grail war. Glad that he finally found his passion. That aside, this has the similar atmosphere with im@s, but with more individual focus and even more positive/heartwarming/mellow/feel good atmosphere. 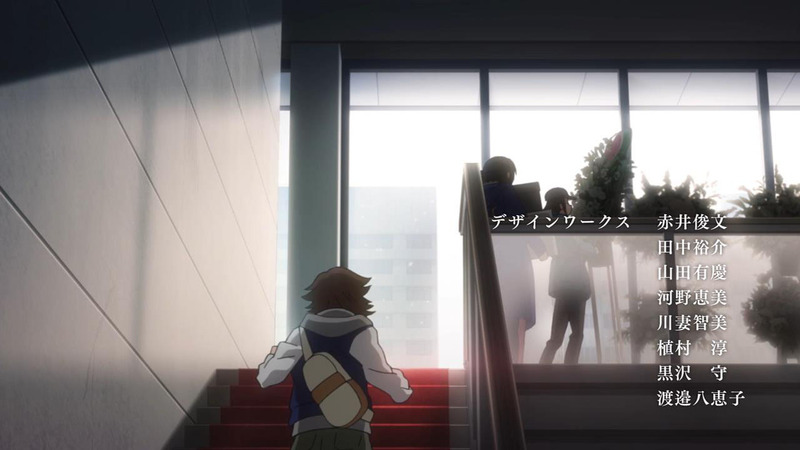 And this is directed by Clannad AS 18 ep director? I’m in! The producer character’s role is generally to support the girls’ stories from the sidelines, so it’ll be interesting to see a producer who mixes up that formula by directly engaging competing idols in hand-to-hand combat. 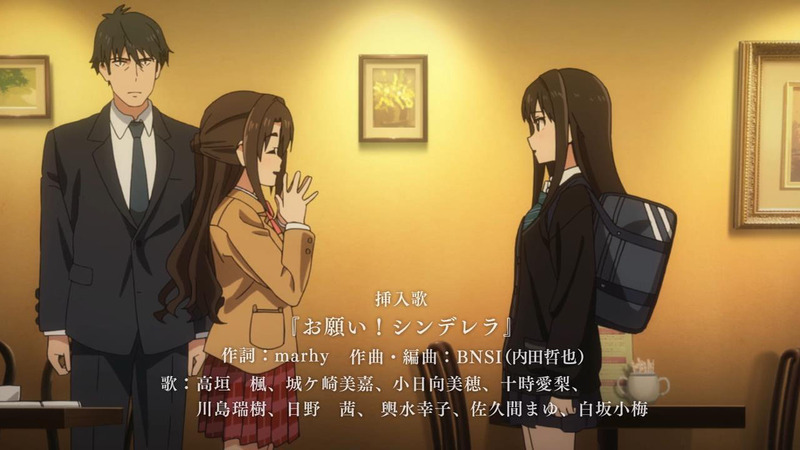 Rin Shibuya needs more screen time. Way to be silent, there. I probably won’t be the one to pick this up, simply because I don’t expect to have much to say about it every week. It’ll more or less speak for itself, as slice-of-lifes do. But we’ll see. Have you seen Death Parade? Did you enjoy it or is it not your type of anime? Is that a show you’d consider picking up if no one else will? Thanks. I find it rather offensive and odd that trollers down vote me whenever I silently hope that a certain series gets picked up. What’s so “downvote worthy” on that? People who don’t like the show & think it’s crap are not trollers. It truly amazes me at the mental facility and mental age of them. Such a neutral reply and it’s 8 down votes… Well done. Than again, they’ve yet to see all of my reasons for hating SAO. Are u new to the internet or something? As WorldwideDepp said, people too lazy to write Yes or No express their opinions by upvoting or downvoting. And thos who disagree with u don’t necessarily have a low mental age. Your being uber sensitive to these little things. Death Parade is in some ways my type of show, but I was hoping to avoid blogging anything too weighty this season so I could just be mellow. We’ll see how things gets shuffled around, and hopefully Cherrie picks it up (she’ll probably do a better job than I), but there’s always more shows than there is time to cover, unfortunately. One of my anticipated series this season and I’m hoping it’ll be as enjoyable as the first iDOLM@STER. 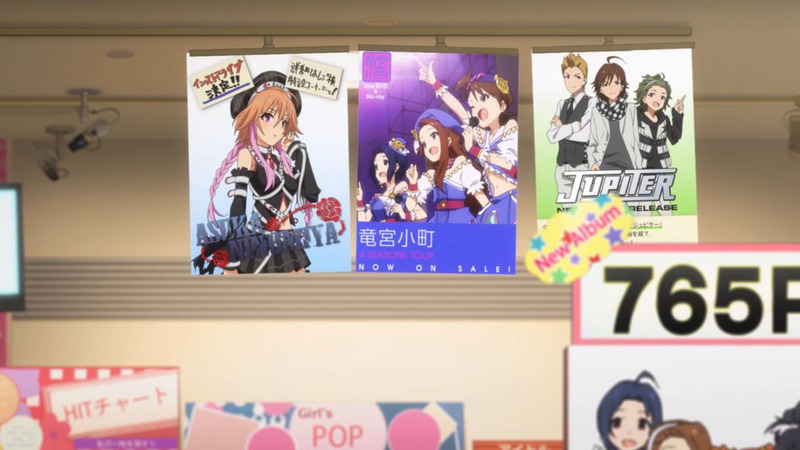 It’s an interesting move how in this series some of the Cinderella Girls are already established idols. I heard the 13 who were chosen to be the main characters were chosen because seeing their growth from unknowns to stars would be most interesting. 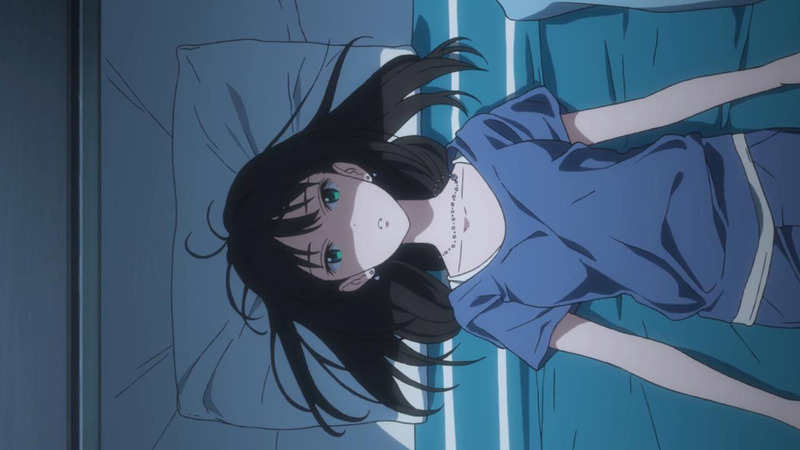 I’m already liking Shibuya Rin because of her cool and calm personality, not to mention she’s gorgeous. 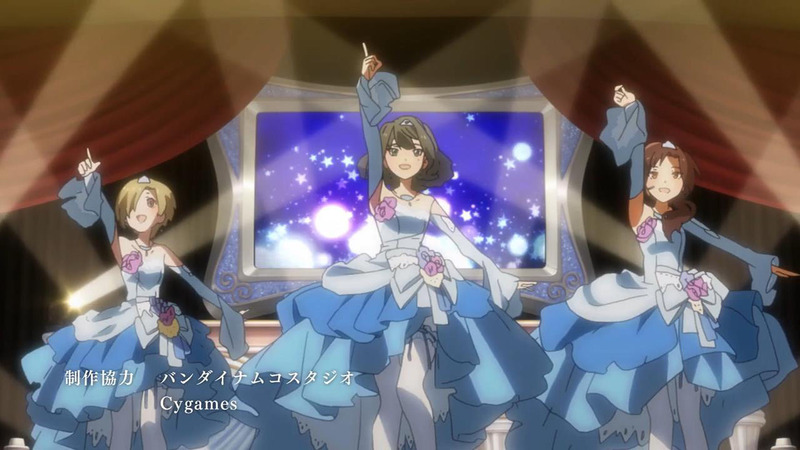 I also can’t wait for my favorite Anastasia’s debut in the story and also Ranko. The biggest surprise was the Producer. I’m guessing being misunderstood for a suspicious person will be a running gag in the story. 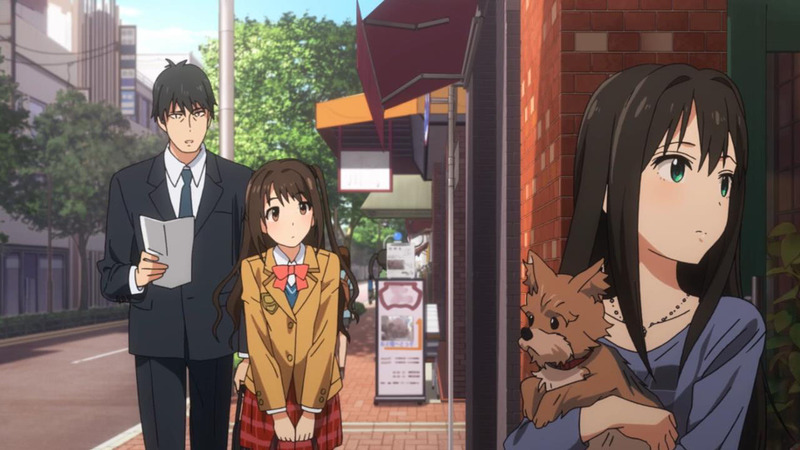 He’s gotta be a nice guy though, seeing that Rin’s dog wasn’t afraid of him. Mizuki… check, Kaede… check. Ok I’m in. Cinderella Girls has a lot to live for the iM@S name. 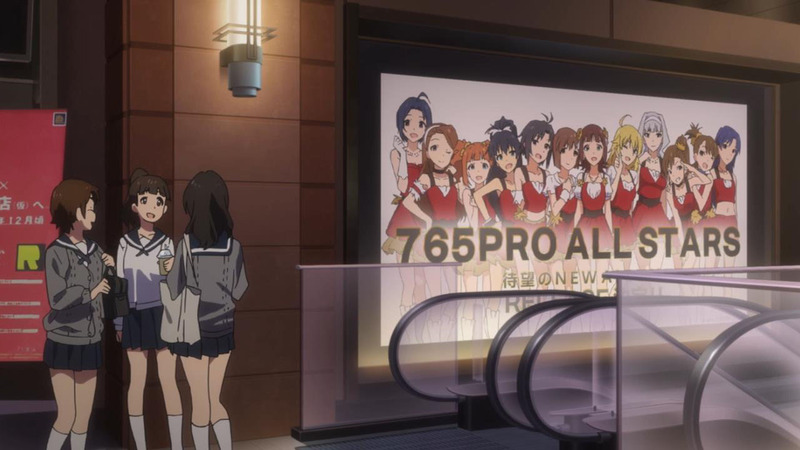 After all, the girls of 765 Pro were part of a long established franchise for a decade with a gigantic discography before it even got an anime. It’s a guaranteed success with an already significant fabase. CG on the other hand is a spin-off with barely has a few years on it so they have to surpass that hurdle. I’ve only checked a few of their works but I am basically blind when it comes to these characters. That’s probably why its moving at a slower pace to introduce all these new characters. All in all, Uzuki an Rin are all right. They pretty much fill the cheery and stoic steroetypes well, and they have decent chemistry together despite not knowing each other. The biggest dud for me though is this version of the Producer. At least with the 765 Producer was a characters who can fit in well with the cast and interact with them. The 346 Producer feels like a blank slate just meant move the plot. Granted its just one episode, so I will have to see how this will pan out. It’s probably why the anime is using more of the earliest game girls as the default group as they would be the most recognizable of them while the others that came later will probably mostly be cameos of some sort. 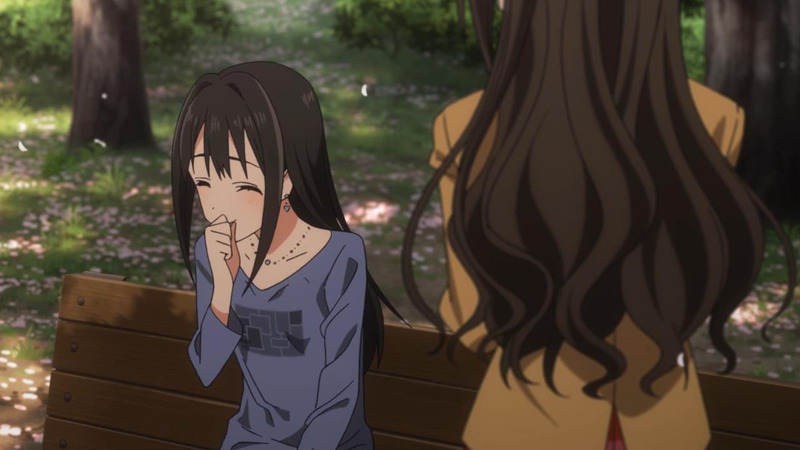 The first three we’re seeing – Uzuki, Rin, and Mio are also individuals from each idol category of the game, Cute (Uzuki), Cool (Rin), and Passion (Mio) and they seem to be evening out with others from the categories too though the focus seems like it will be on those three individuals primarily. I can’t believe my producer is a yakuza Hachiken Kazumasa’s younger brother. I had a grown up Hachiman feeling. At least i imagined him growing up to someone like this. Few worded stone face because he got all out of cynicism in college. 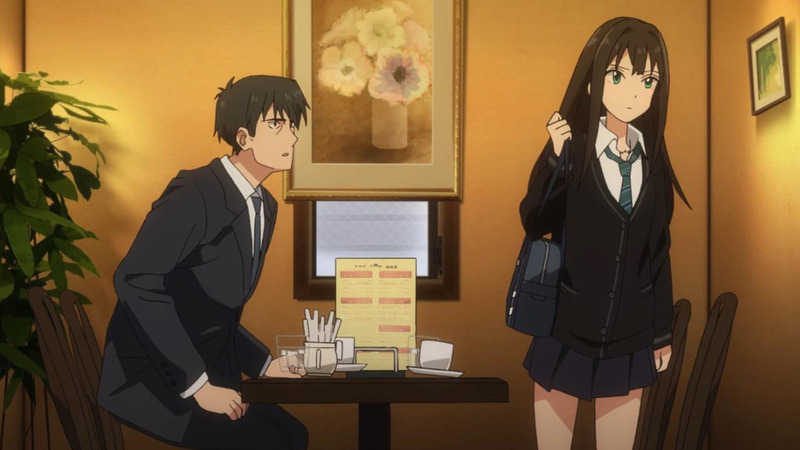 What are you talking about Hachiman is really talkative. Passersby, I appreciate the coverage of the anime since I think it’s going to be even better than the original. Even then, the original was running under the radar and it was not until around episode 9 that people started watching it weekly back in the day. I imagine that CG will be more of the same thing. Now you said that you’re a skeptical person by nature. 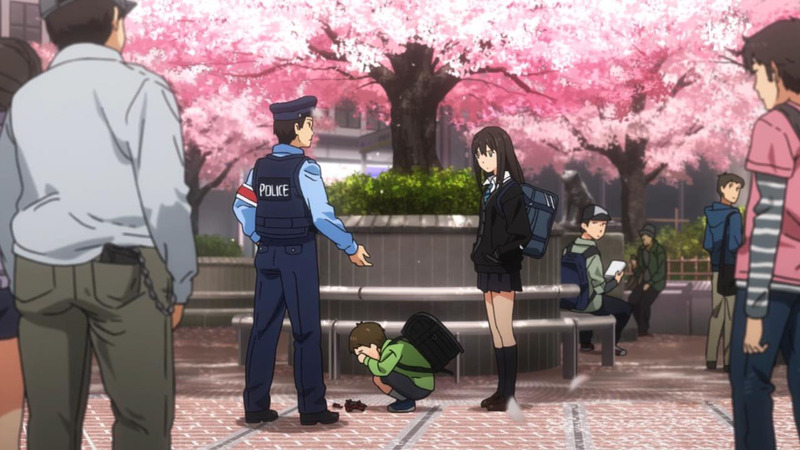 How does that in any way prevent you from appreciating “feel-good” anime like this one? Because you somehow know that the world is full of bad things? 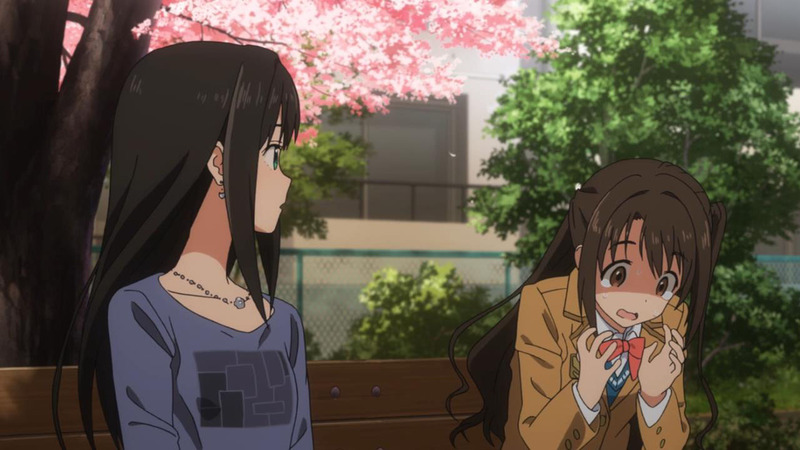 Wasn’t Rin skeptical of the Producer before giving in thanks to Uzuki’s help? Does that mean that because of the overall positive tone of the anime that these people don’t know negativity and that’s why you can’t take them seriously? I’m disappointed. I’m also disappointed in people who think Idolm@ster is a crappy anime. 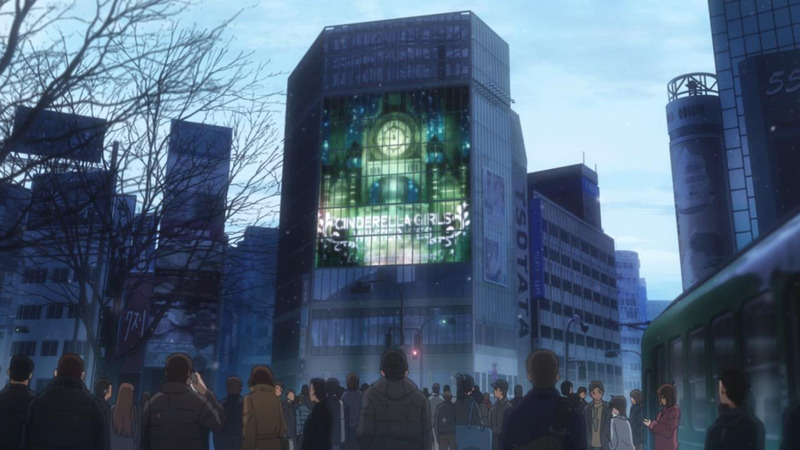 Did you enjoy your troll twist in Aldnoah Zero? Did you enjoy the fact that Death Parade had to pull out a dancing opening to blunt the fact that it’s an edgy anime? It’s probably going to be a Death Billards remix. When that happens, I’ll be there to tell you: I told you so. Barakamon was a feel good anime yet it did not receive this kind of treatment from this blog. Very very disappointing. Barely 1 episode in and we’ve got haters already. 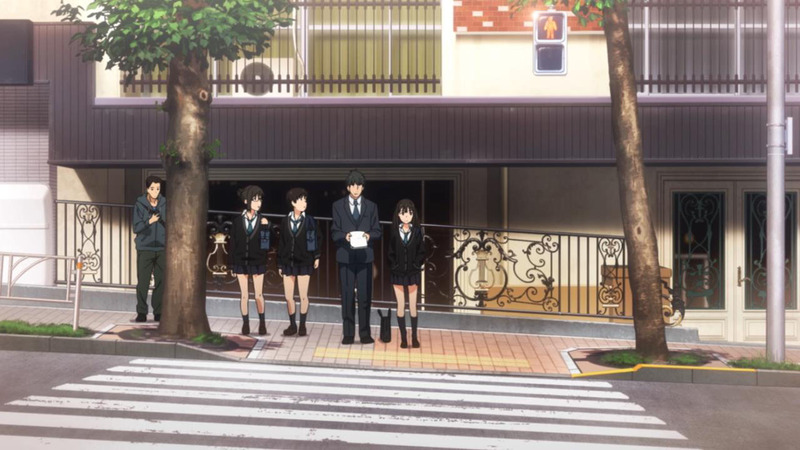 I feel for other feel good anime like Koufuku Graffiti. You assume that RC cares what you think. And what the hell does Death Billiards have to do with this? Personally, I haven’t seen it DP yet but I don’t get why you’re comparing them. January 11, 2015 at 5:12 amDisappointing. All that person said was that he/she liked Rin and that she needs more screentime. Also, hoping that someone picks this up for the weekly. Cue downvoting and reasoning like this. One person said that these people are not “trollers” because Idolm@ster is apparently a crap anime. @Ihor: Yeah right. Death Parade was out before this entry, why are you suggesting he cover it when it’s already covered by another person? I brought up Aldnoah because for some reason these types of anime are the only ones worthy of getting blogged in this site when in the past RC did not judge based on genres. Now it’s all edgy animes. I don’t see Dog Days anywhere, yet it has more action and is just as brainless as Free. Idolmaster also works with the same values as Kuroko no Basuke like Passersby said, but you don’t see the same kind of hating. Look at their comments section. Since you keep bringing up Death Parade for some reason, if you’ve bothered to read you’ll know no one has picked it up for weekly coverage yet. Cherrie is still undecided bec she’s already covering 2 shows. I think that’s why @Ihor asked Passerbye in case he’d want to. January 11, 2015 at 5:19 amDisappointing. I criticized Passersby for saying that he cannot take this anime seriously because of its overall positive tone, and based on that reply he won’t be blogging it. 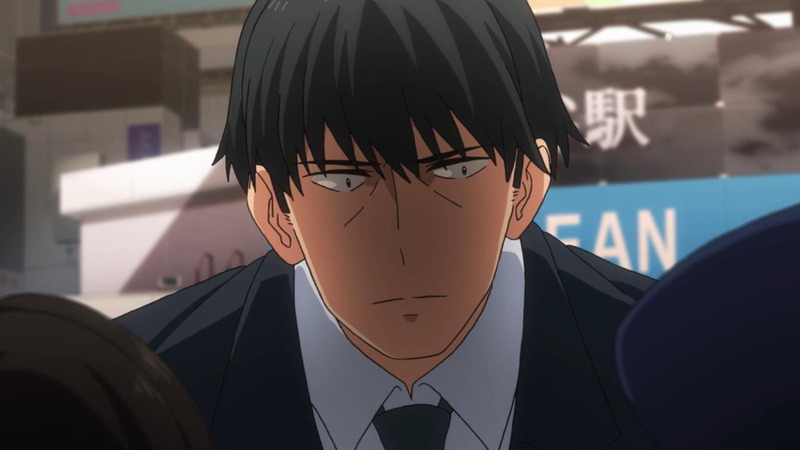 He has no right to talk because Amagi Brilliant Park is running on the same kind of tone as this anime. It’s why I don’t buy his justification because he covered another anime last season with the same kind of tone. Now if he said he’s not covering it because there’s better shows and that he doesn’t have time for this, then maybe I’d leave him alone. But being a hypocrite is something a blogger should not be presenting. Wait, are you bashing on Death Parade bec of my request? I’ll have you know I love both IDOLM@STER (watched it back in 2011) and Death Parade but Passerby said he has no plans of covering IDOLM@STER so I thought of suggesting the other one. You shouldn’t generalize and jump to conclusions. And also, why are you bringing up Aldnoah Zero??? Regardless what detractors say, RC still continues with their weekly objective coverage and civil comments section. Nonetheless, there’s no harm that certain shows get picked up this season. SHall we have an edit button here? Let us not fight. The IDOLM@STER post should be a no fighting zone. In the spirit of iM@S, let us all get along. Hugs all around. You may have missed me saying that I actually like shows like THE IDOLM@STER. In my writings on the series, I sing a lot praises. I even covered the movie! Movies are hard. I totally appreciate feel-good anime. Aria is still one of my favourite shows of all time. I’m afraid you have me much maligned. All that said, it’s true that I don’t take THE IDOLM@STER very seriously. Specifically, I don’t take its conceit very seriously. A world where there’s a hugely competitive pop idol industry, but all our girls are simply good and pure? If I were to take that seriously, I’d have to rip it apart. Being a generally jaded individual, I have a very dim view of human nature. ‘Friendly competition?! No! It should totally get Lord of the Flies in here!’. I’d be full Kuroi. But I don’t take it too serious, and don’t have to stare at it too hard. I allow myself to just accept its premise. 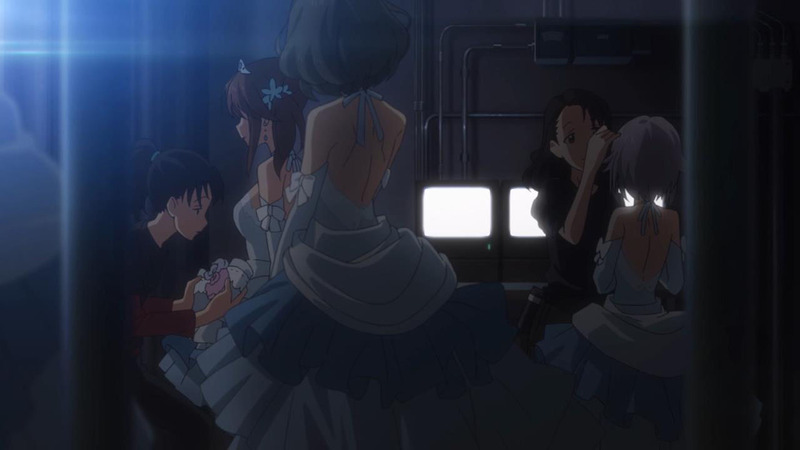 Or rather, I enjoy THE IDOLM@STER enough that it’s easy to suspend disbelief. None of that precludes me from poking fun at it though. I make fun of everything. I teased Amagi Brilliant Park plenty as well. I do not believe that there exists a subject so fragile that it needs protection from satire. It goes both ways; I make light of THE IDOLM@STER‘s idealism, but I also make fun of my own cynicism. The key words are ‘make light’. It simply is not that big a deal. I’d hate to have to ever take anything so seriously that I can’t make jokes about it. What does Aldnoah Zero and Death Parade has to do with this? Also you’re taking down votes way too seriously. In case you haven’t noticed there are actually a lot of people who down vote just because! So why are you so bothered by it? I agree to the extent that there is nothing wrong with feel good anime. As seen in the comments above, there are obviously people who dismiss it at first site. That is fine; not everything is for everyone. But saying things like the genre should be destroyed, etc is disgraceful. Sure, it is “cute girls doing cute things” and is “feel good”, but what is wrong with that? If I always have to deal with something grim all the time (e.g. if I was an A&E doctor, having to deal with injuries all the time), isn’t it natural to want something on a lighter note? January 11, 2015 at 5:38 amDisappointing. Nah I don’t need RC to cover it. I’ve moved on to better blogs, especially when RC started turning “mainstream” a few years back and when they started using this retarded voting system. I’m just calling out things that I see fit to call out. It’s also very sad to see RC’s primary audience change from anime fans to edgy elitists. That one person at the top didn’t need to get downvoted for an opinion. These people too. So sad. Meanwhile if this was Shounen Hollywood or something no one would dare do these things. It can be fun here when there are enough people with a sense of humour. The Aldnoah Zero caption sessions were great. It seems some people have been on the receiving end of grudges here too and the vote system is simple to abuse. An edit function would be better than a vote function. I take the constructive approach, I never downvote and if a comment bothers me enough then I take the time to reply. You seem to be a reasonable person and your what you say is perfectly valid, whats sad is that if enough people read this you (and quite possibly both of us) will end up as hidden comments. hmmm… so according to you RC is now “mainstream” and yet the primary audience are edgy elitists and not anime fans… uhhh… what? So far I’m underwhelmed. The pacing of this episode was VERY slow. It doesn’t help that their Producer barely talks and had a dull personality, even though he’s the catalyst for the plot! I actually liked the producer. The girls are all fairly overt, but he’s more subtle. His poor communication skills feels like a part of his character. Right? I think he really feels like a real person. He probably excelled in the business side in his schooling but now finds himself in a situation outside his comfort zone – the idol industry. His intensity is also off-putting (the cop lol) but it’ll probably go to show his dedication to his job. The art style fits very well for the anime adaptation. 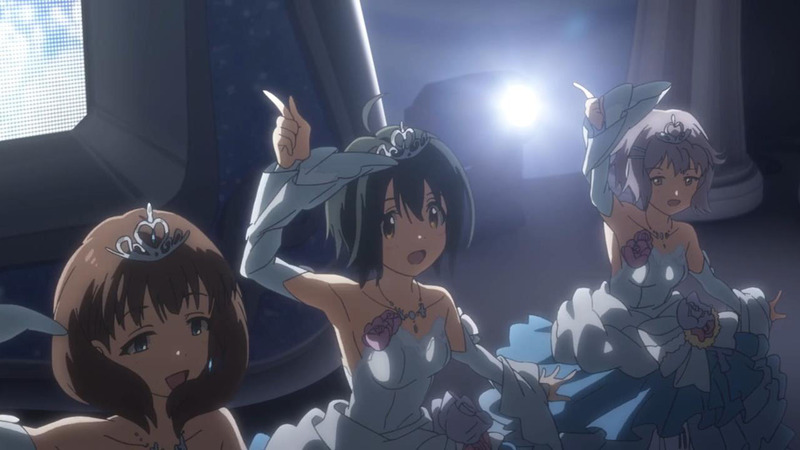 Just to go back to one of my points from Kantai Collection, let’s look at the scene where Producer-san manages to convince Rin to be become an idol. Just imagine if this scene was done in the same way as Kantai Collection’s Fubuki scene. The way it was done there, I felt pretty much nothing for it. This way at least I feel a bit of connection to the characters. This first episode alleviated those worries. 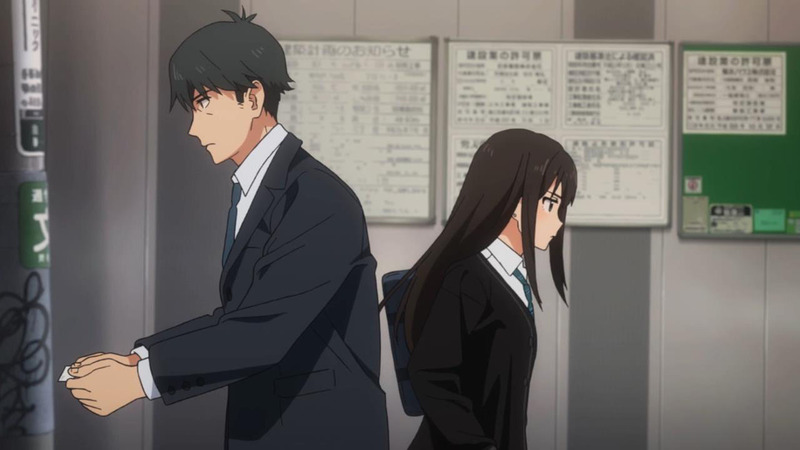 I felt like they did a good job with the characters, and I actually really liked the new Producer-san. P.S. to staff involved who will never read this: Tsubomi Yumemiru Rapsodia animated please. That is all. Looks like Souichirou Kuzuki-sensei left his school job for an idol recruiter job. Ordinarily I’m not a fan of the idol genre. (I don’t really get the appeal of the finished product as entertainment. Not my thing.) But as a SoL anime, it works. It was amusing/interesting enough to keep me engaged for 23 minutes. Then again, as far as idol content, there wasn’t a whole lot. 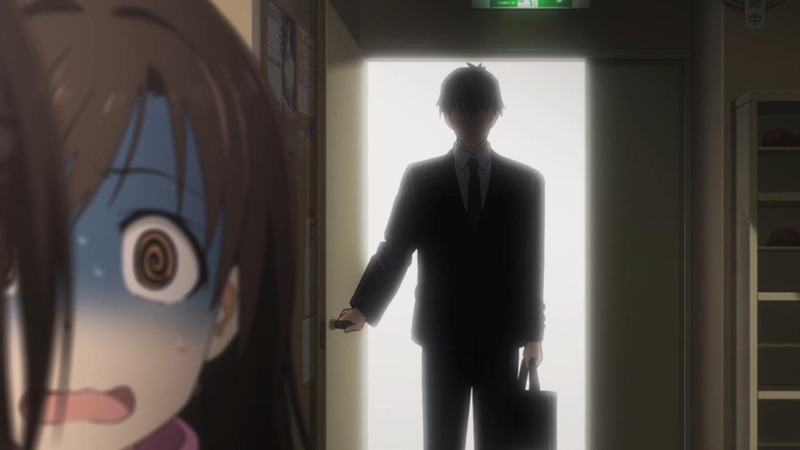 Producer-san might as well have been “recruiting” young girls for his hit squad a la “Gunslinger Girl” for all I know. I’m probably going to keep watching because of that incredible positivism. There are enough dark series out there, that some pure light is appreciated now and then. Plus the Producer is a character that actually adds to the whole thing. You can sympathize with the guy. Dedicated to what he does, but having some weak points that makes it difficult. Being that big and frightening probably does make recruitment pretty hard on the guy. The first two girls given some real focus seem nice enough. A contrasting pair with the third girl only just shown at the end. Should be a fun show to watch. If the first series was any indication, the road is just as much development for the Producer character as it is for the idols. In the games, aside from general back story in terms of the business, the “Producer” character was faceless as you, the player, were the self-inserted “Producer”, but in the anime, they now have to make the Producer into an actual individual with his own personality and character quirks and whatnot which I hope (but am not optimistic about if episode one was any indication) will happen with the Admiral in KanColle. 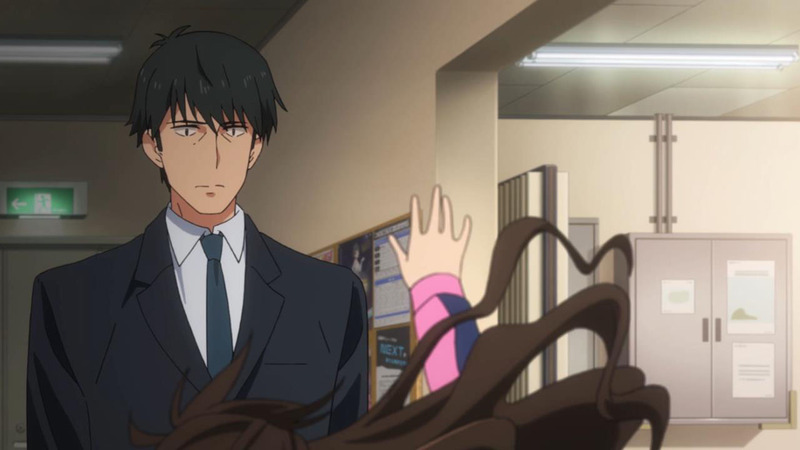 And, as we saw, rather than simply repeat the completely nice guy Producer character type, we have one that actually has arguably MORE difficulties to overcome simply because of his intimidating appearance, and not just the idol business. Aha! Not only do I need to watch this, I just realized that this is a spiritual continuation of the original Idolmaster anime universe, just not of the previous group. 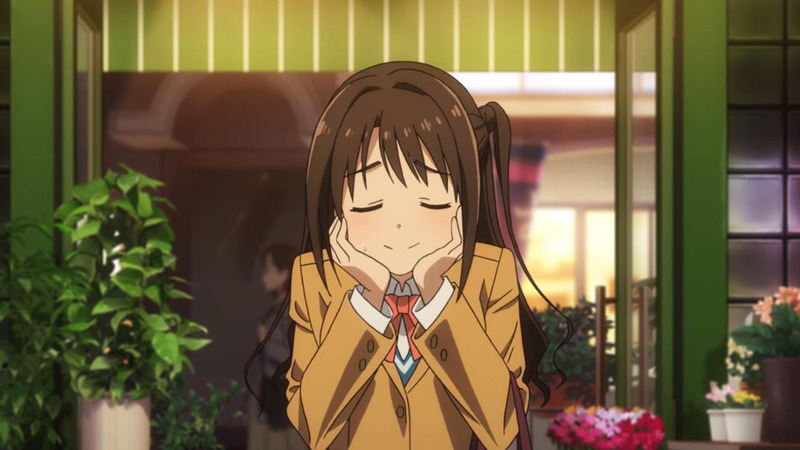 Uzuki was a member of the group that stayed with the 765 Idols from the Idolmaster movie. I knew I spotted her before! I must watch now because of that. So this is like a DS9 type of next season, thing. :( It makes it all the more sad that Uzuki’s the only one of her group that stuck it out. I’m not so sure this may be the idolized (heh) version of what goes on, after that bombshell is dropped. With the slow pacing and the deliberate way of trying to build the group, I’m thinking that this might be a case of we might see a bit more of the hardships that go on, rather than just watching the girls begin their ascent to greatness like in the original series. On a side note, norms didn’t notice our little yuri-ish tease at the near end. I love Rin Shibuya she is the Chihaya of this team huh? I love those character types. Also hoping to see the O.G 13 make appearances not in advertisement form lol.